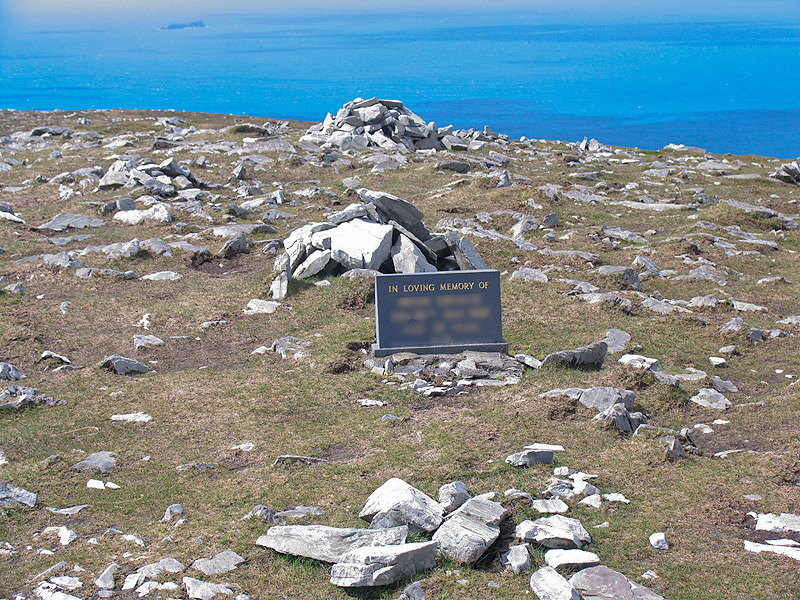 "As this is a historic event that can only ever have one definitive location" .. but there's hundreds of plane crash sites in the mountains of Ireland of which this is just one example. There would only be a quantitative distinction between this crash and others. In fact a stronger case might be made for many others because they involved loss of life. If we allow this then we will allow various advocates for other crash memorials to try to put up memorials followed by yet more pressure to put up personal memorials. These memorials then destroy the sense of the wild very rapidly for everyone else. While of course all of us wish to preserve our fond memory of the departed dear to us, we can do this without compromising everyone else's enjoyment of the wild. Similar goes for crosses and religious memorials. Take a look at the attached picture from near the top of Minaun in Mayo. This memorial destroys the huge panoramic view and is quite inappropriate in its location. It is possible to commemorate without impinging on everyone else. By arrangement with the Wicklow Mountains National Park the Ramblers have a commemorative area for departed members in a wood on the side of Derrybawn. Never heard of it? But the people to whom this is relevant have and that's the point isn't it? Say no to this petition - it will have further consequences. Support the Wicklow Mountains National Park when they regulate memorials. Oppose inappropriate encroachments on our wild areas.